I do this thing every year to make sure that I’m on track with my life. It’s like a big life check-in. It’s called Astrology. Now I’m sure some of you are rolling your eyes right now, like my son always does when I talk about Mercury Retrograde or when I text him a picture of his horoscope from my favourite astrologer in NOW magazine (a local Toronto Tabloid). I did my beginning of the year check- in recently with a new astrologer. I like to get different perspectives. And he had an interesting take on my marriage. Apparently, it was in the stars that it was a “miserable” marriage. To which I said “yeh, duh”. And then he also said, “You made a deal”. What? How did he know that? I did! I made a deal that I would assume the “submissive wifey” role, in order to have children. I admit that wholeheartedly. I knew that I wanted my husband to father my children, because on some primal level, I knew he had good genes, a strong immune system, a super sharp mind and the ability to support us financially. All things that meant the most to me back then. But this was very unconscious at the time. I was really young and was simply listening to the baby making clock in my body. When I started to realize what I did (I stopped my career and became economically dependent and I took on the role of fixer) I was already in the thick of it and had a long list of excuses as to why it would be impossible for me to break free from the self-imposed jail. I threw myself under the bus. I put myself dead last all the time. And this didn’t stop after I was divorced either. This patterning showed up in many different ways in all relationships. I realized that until I was able to recognize it and take full responsibility for my decisions, only then could I start to change this patterning. Here are some of the questions I asked myself, to see the patterning that kept me in “Emotional Jail”. Is this going to make me happy or am I compromising myself? Am I putting others needs ahead of my own? Am I having fun here or is this wasting my time? I know that you’re thinking that you have to compromise sometimes in order to make a relationship work. That’s part of our brainwashing. It goes along with the thinking that you are selfish if you put your needs ahead of others. But that’s simply not the truth. It’s part of your foundational programming. And this is the work right here. Retrain your thinking to accept that if you don’t care about yourself first, then we cannot care for others. You become so depleted that you will have nothing left for anyone, especially yourself. Sound familiar? You have to put the oxygen mask on first in order to help others. This is natural law. And if you are here reading this then you know that it’s true and that it applies to you. 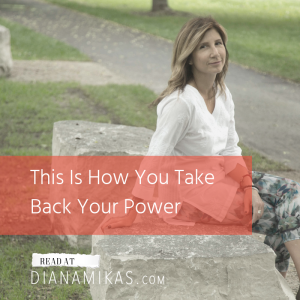 So, how are you going to take your power back to day? Simply do these 3 things. When you take full responsibility for your life, then you start taking back control of it. It’s time to break free from your self-imposed emotional jail.